We awoke for our final morning at “Farmhouse 3” with muscles ready for work, having been able to soak them in the hot stone bath at the farm, and strengthen them with the delicious home cooking of our hosts. 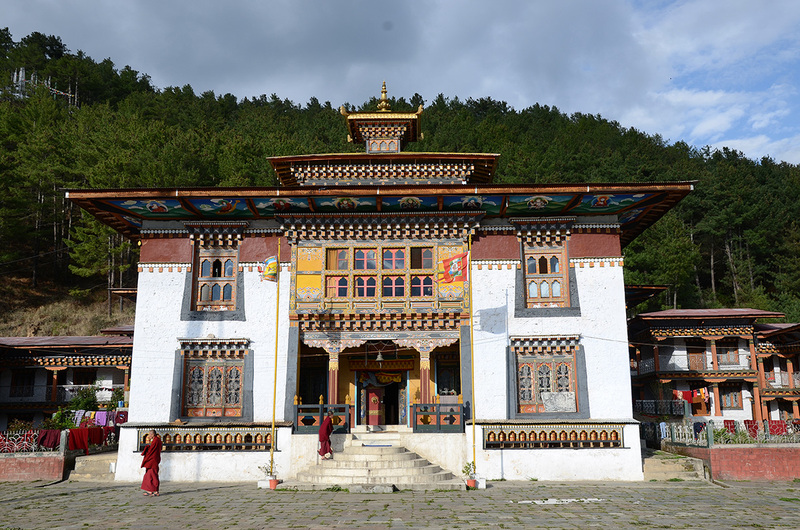 We were heading back to the heart of Bumthang to begin our three-day volunteer work at the Koenchog Sum Lhakhang. In the early morning sunlight mountains were shining and crisp, and closer to the intermittent clouds than most places in the world. It was a welcome and breath-taking sight after the many days of rain prior. We departed after breakfast, leaving behind the farmhouse and the apple tree in bloom in front of it. The muddy road took us the hour’s drive back out of the Chokhor valley, past the Swan Temple where we ate lunch on the 23rd during our hike through the pastures and forest paths to Dramtse Dzong and site of the GNH Centre. 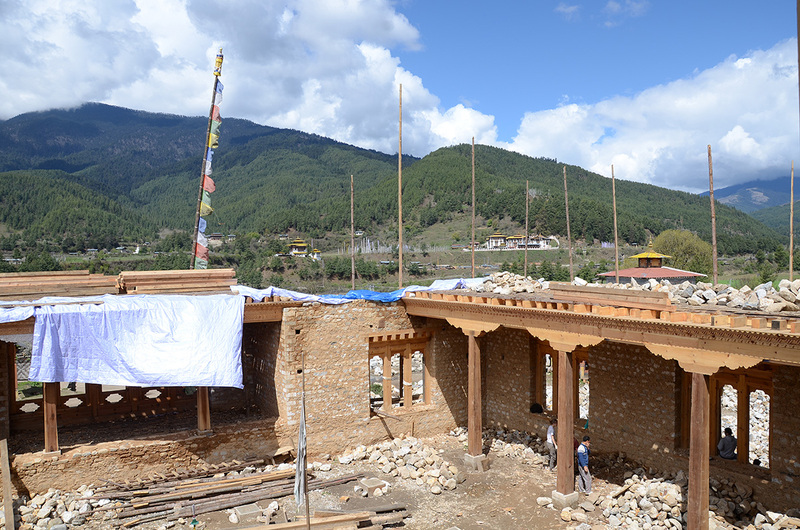 With a round of applause for Leki Dorji, our driver, for successfully navigating us through the rutted and difficult new road, we arrived at our work site, where the Koenchog Sum Lhakhang is being rebuilt and expanded. Construction is expected to be complete in 2018. 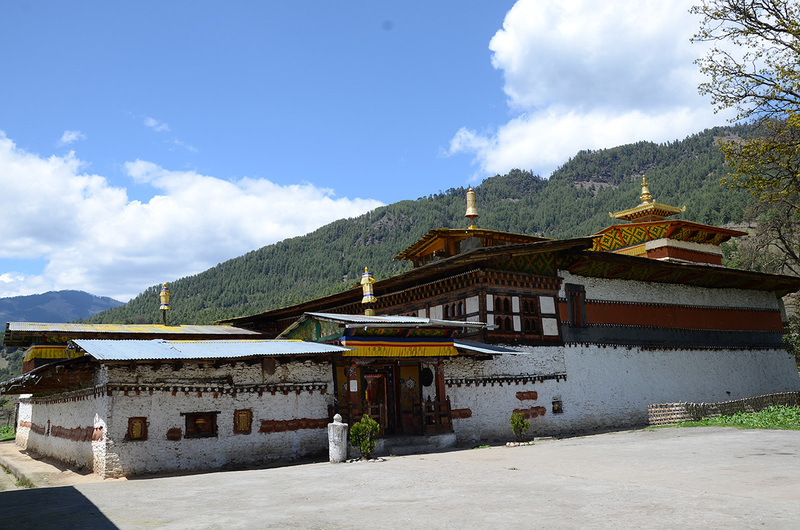 This monastery burned in a fire in 2010 when a curtain blew into the flame of a lit butter lamp; these buildings are highly combustible, given the importance and everyday use of butter lamps and the immense amount of fabrics and wood in the shrines and rooms of the temples. Our guide Tsewang predicted a switch someday to electric lamps instead of butter, because fires are all too common. He sadly noted that once a fire starts, there is generally no chance of stopping it. 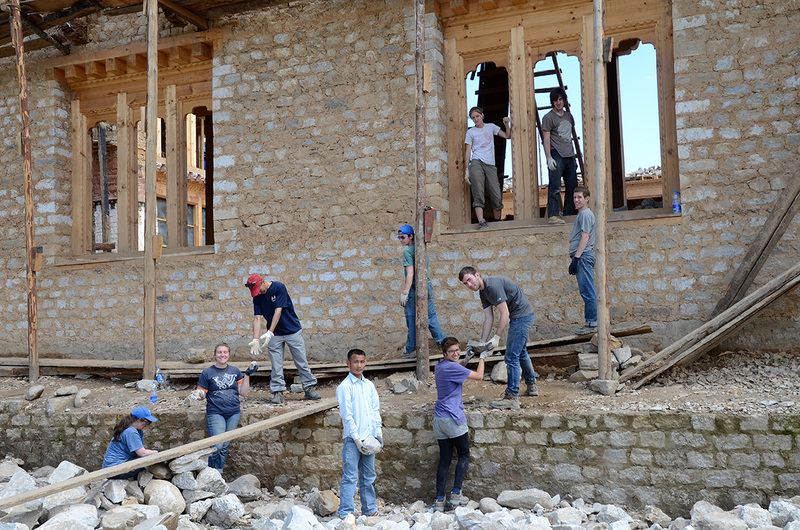 Reconstruction was well under way when we arrived, thanks to the generosity of the many funders of the project and the help of volunteer laborers such as ourselves. 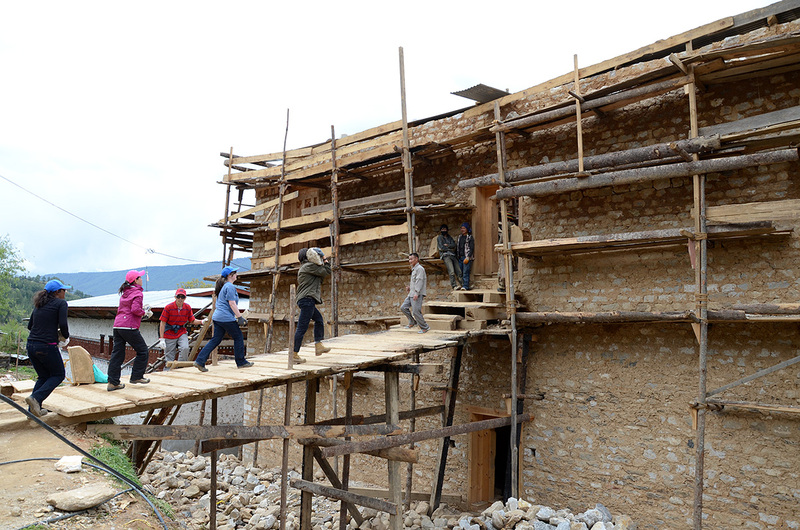 Tsewang mentioned that sometimes if the nearby hotels have no guests, the staff come and put in some work. Unlike in the States, where it seems that sites like this would be worried about liability, here, anyone and everyone was welcome to help out in whatever capacity they could. We piled out of the bus, donned our work gloves, and met the Lama in his red monk’s robes and the master mason in his black baseball cap and muddy Western work clothes. The Lama led us over the piles of stones around the left side of the building (keeping the temple to our right, of course) to the rear where we would do our work that day. The site consisted mainly of a central building that surrounded a shrine housing a spectacular statue of Vairocana. Although the three precious jewels- in this case the Buddhas of the past, present and future -that give the Lhakang its name will not be placed in the shrine until the temple’s completion, the shrine room held many beautiful and fascinating relics, such as half an iron bell the other half having been taken away to Tibet by Tibetan invaders. This shrine was fairly unusual because of its portrayal of Vairocana with a flame-ringed mirror. Vairocana is one of the five meditation Buddhas who emanated from the primordial Buddha. 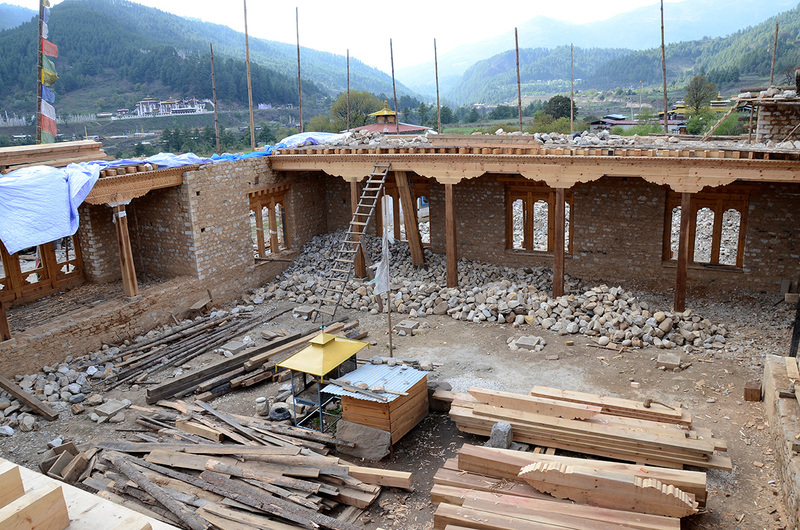 The first story of the outer four walls of the Lhakhang were mostly complete upon our arrival, and many of the beams and window cases already displayed elaborately sculpted woodworking, all of which had been done with simple chisels. 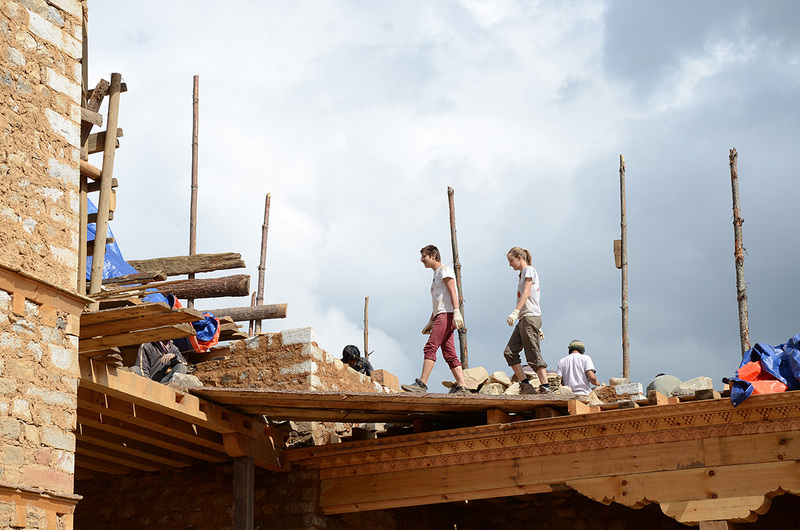 For our part, we had two tasks before us: to haul stones into the temple on the second level where they would be used to build the walls, or to pound mud into a fine powder to be used for mortar and plaster. When working with the mud in the “sandbox” as we jokingly called it, we used large wooden mallets to break up the dirt clods. The pounded dirt was then sifted and proportionally mixed with sand to be made into the finished product. 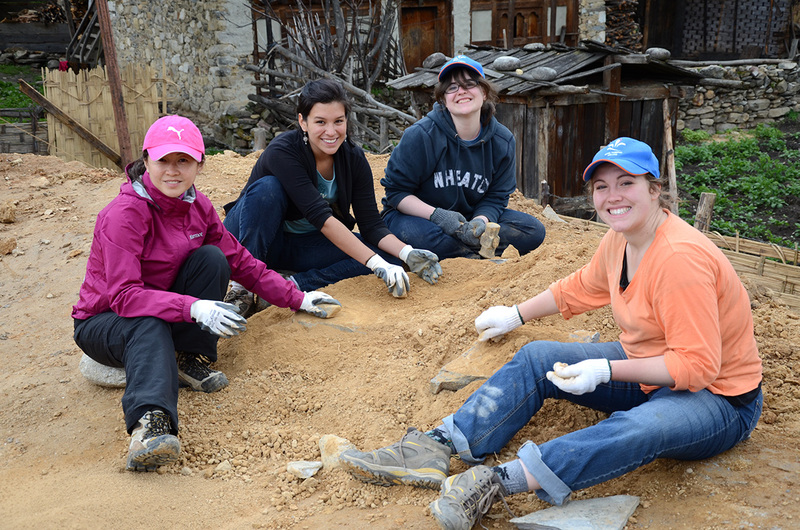 When working with the rocks, our hands and hardy bodies were our only tools. Most of us elected to begin with the rocks, keen to prove our strength and eager to earn some karmic merit. We were instructed to move the rocks, some of which were very large, up a ramp to the back door of the temple, across the rough plank floor and a very rickety plank bridge to the left flank of the building where the rocks would be piled in the open air for the skilled workers to refine their shapes and place them in the wall with the mortar. At first, this journey, even when unladen by the granite blocks, seemed pretty intimidating. We were about 15 feet above solid ground, and many of the planks wobbled or turned to see-saws when stepped on. We were cautioned to keep our thoughts on safety at all times, but, for Carrie, it seemed easier to put the danger out of mind, and imagine what kind of being she might come back as in her next life. Perhaps her sins, she thought, would not be so bad as to warrant coming back as a leech, but rather one of the stray dogs of RTC that gets all the lunch scraps. (Professor Owens can’t help but note that, from a Buddhist perspective, this is a rather unusual aspiration, as dogs and other non-human animals occupy one of the hell realms from which one cannot achieve release from the cycle of rebirth. On the other hand, such modest aspirations do befit a modest ego.) One of the supervisors shared our concerns, and laid more rough hewn planks on the ramp, making it much more solid and better suited to supporting relatively large chillips (foreigners) carrying rocks. When the lunch bell rang, we followed the workers to the building that served as a temporary extension of the monastery. We were quickly ushered into the monk’s assembly room and away from the mess yard that served the work force chilies and dried beef. The assembly room was spacious, wood paneled, and had an incredible view of the Choekhor valley and Kurjye Lakhang. Because our packed lunch had not yet been brought from our hotel, we took a tea break instead. We drank milk tea and ate tsao, a deliciously addictive fried rice snack food. Our tea break wrapped up about ten minutes before the bell rang, marking the end of the workers’ lunch break. In this interim time Ben found a group of workers playing football. Unable to resist this opportunity to interact and bond with these guys, he tagged in and kicked the ball around for five minutes or so. When the bell rang, we trudged back up the hill to the construction site. Eager to help in any way that we could, Ben followed his new friends to a rock pile and helped to load rocks that had been cut to be cornerstones into a wheelbarrow. He and his new friends then transported these stones to a pile of similar rectangularly cut stones inside the lhakhang, while the rest of us carried on with our assigned task of hauling rocks with our hands. In what seemed like a very short time the bell rang again, calling the workers in for another tea break. Passing by the dining yard where the workers were happily collecting tea, Ben saw one of his new friends, Sonam. Sonam waved, and in response Ben ducked over and joined the line to get tea. Alec followed him, and they tried their best to act like they fit in with the tough atmosphere of the yard. They quickly realized that, as per the custom, every worker had their own cup, and that these two chillips would have to blow their cover and ask for cups if they wanted to have tea. Sonam took them into a back room where cooks were stirring steaming vats of dried beef and chilies, and asked where they could find an extra cup. But preferring not to inconvenience these working men, Ben instead invited Sonam to come and have tea with the rest of the Wheaton group in the guest room. Although Sonam declined (knowing that Wheaton students had been granted the special privilege of using space usually reserved for monks and guests) and this attempt at meshing with the culture of these Bhutanese workers failed, Ben felt he learned a valuable lesson. The next day he was back at the yard for tea, this time carrying a cup that he had borrowed from the hotel. 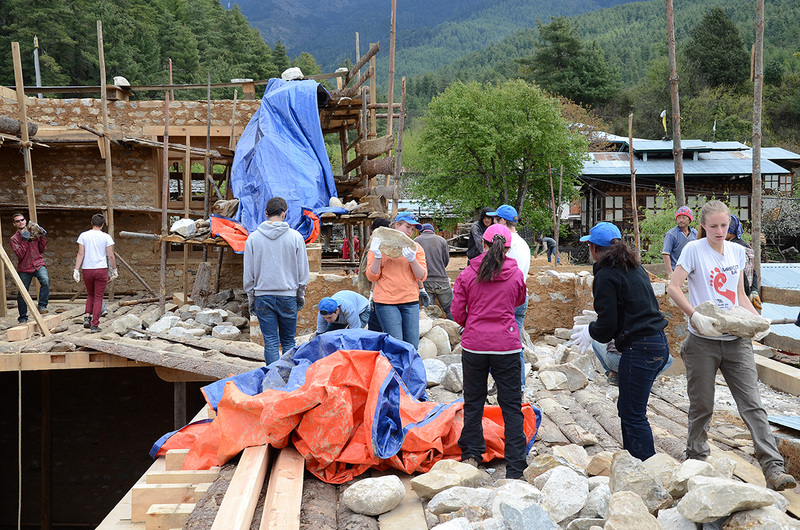 After the tea break, we all went back to moving rocks, now on the right side of the second level of the lhakhang. A light rain had started to fall, and the rocks and the ground were both getting wet and slippery and the going gradually became treacherous. 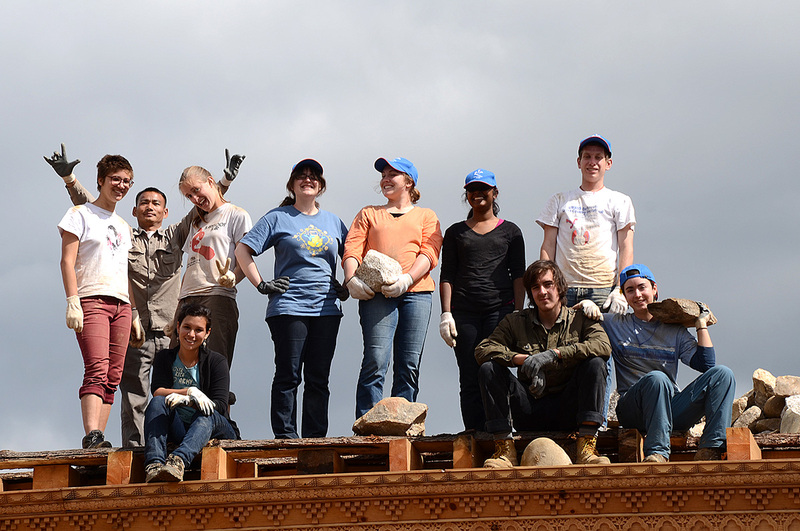 Despite Tsewang and Prof. Owens’ worries about casualties, the floorboards bore us without injury and the floor did not cave in, even from the impressive weight of the rock piles we had transported. After about half an hour more, Professor Owens made the call to wrap it up before anyone did hurt themselves. We finished the day having exhausted all possible rock puns, and with an immense sense of accomplishment, both in the muscular feeling of bodies put to good use, and the knowledge that we moved these stones to where they will sit for centuries. We piled into the bus and went back to enjoy hot showers, good food, and a sound sleep at the Wangdicholing hotel. 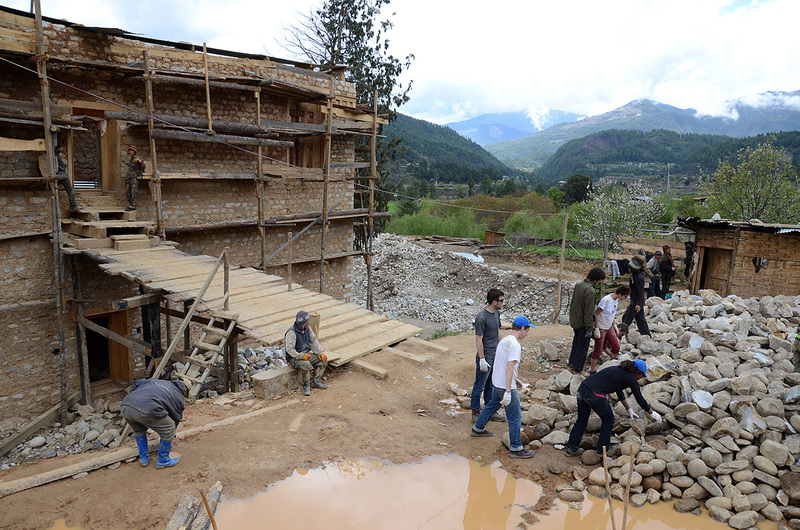 The second and third days at the construction site were similar to the first, except that we switched from moving the rocks to the scaffolding on the second level to moving smaller rocks in through the side windows to make piles inside the bottom level of the lhakhang. These stones would be used to build the temple courtyard floor. We built a series of ramps from the outdoor rock piles up to the windows, and then formed human chains. One by one, we tossed the stones to each other until they made their way inside the building. After we had completed two days of this task, our indoor rock pile was above the window sill and extending almost all the way along the inner wall. While in the middle of loading the rocks along our human assembly line, we noticed a slim, bespectacled woman in a fashionable kira walking toward us with a notebook and voice-recorder in hand. Somehow, the Kuensel newspaper had heard about our volunteer work and reporter Sonam Choden was there to cover the story. The group sat down to answer questions, and Prof. Owens, Ana, and Carrie were personally interviewed. Although contributing to the Lhakhang was a reward in itself, it was fun to get some publicity too! 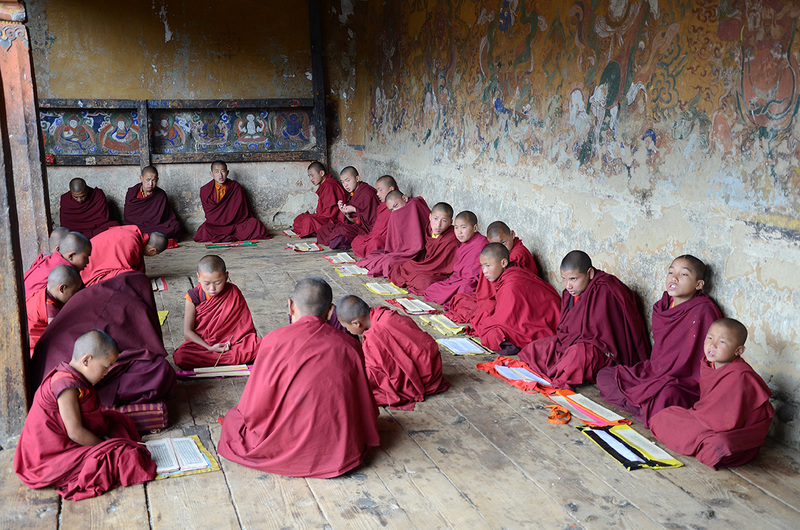 When the work was ended on the second day we visited the neighboring Tamshing Goempa, where many young monks were practicing reading aloud in efforts to memorize their texts. We went past them to the inner chamber where a corridor surrounded the shrine. While we circumambulated the shrine, Tsewang held up a 50 lb. chain-mail cloak made by Pema Lingpa in the 16th century. Amazingly the chains had not tarnished or rusted at all since their creation. Tsewang told us that we were to drape it over our shoulders in turn and make three laps around the shrine, wishing all the while not to be reborn in the lower three realms of the Wheel of Life. Since there were eleven of us, he said, we would have to run. Alec took the winning time with 55 seconds, though we were all left panting by the end. The shrine at this temple was particularly special because it depicted Guru Rinpoche looking up into the sky. Legend has it that this statue was constructed by Dakinis(tantric female deities), but before they could complete Guru’s hat, they flew away into the night sky, Guru’s eyes following them as they departed. 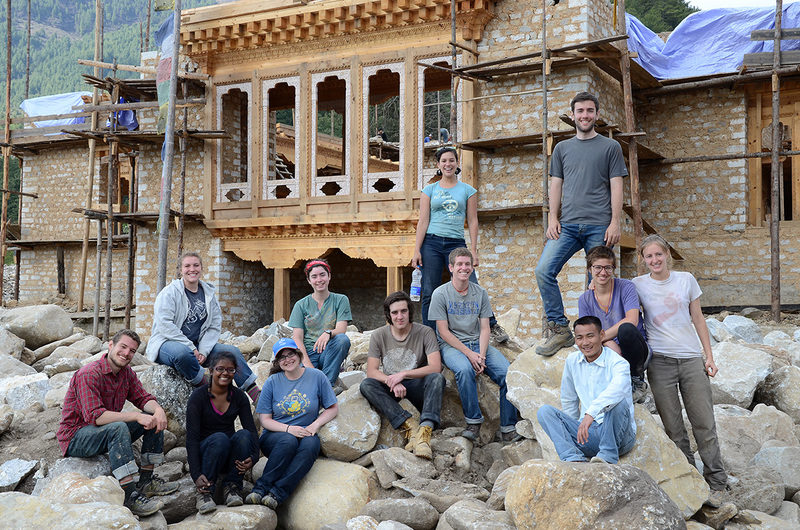 We visited another monastery, Lhodrak Kharchu Goempa, after completing our third day of work. Built to house monks fleeing the Chinese invasion of Tibet in the mid-twentieth century,this one was much larger than Tamshing Goempa , and overlooked downtown Jakar. 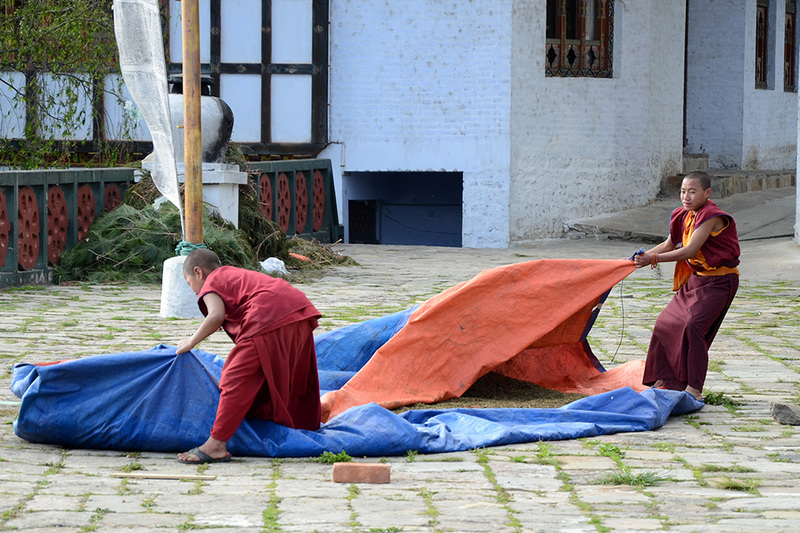 In the courtyard, tarps were covered with drying juniper used to make incense. At the far end of the monastery, an enormous surprisingly sunny hall was filled with rows of hundreds of chanting monks. On the flanking walls, the shrines were illuminated by multicolored blinking lights, giving the temple a modern twist to its decorations. 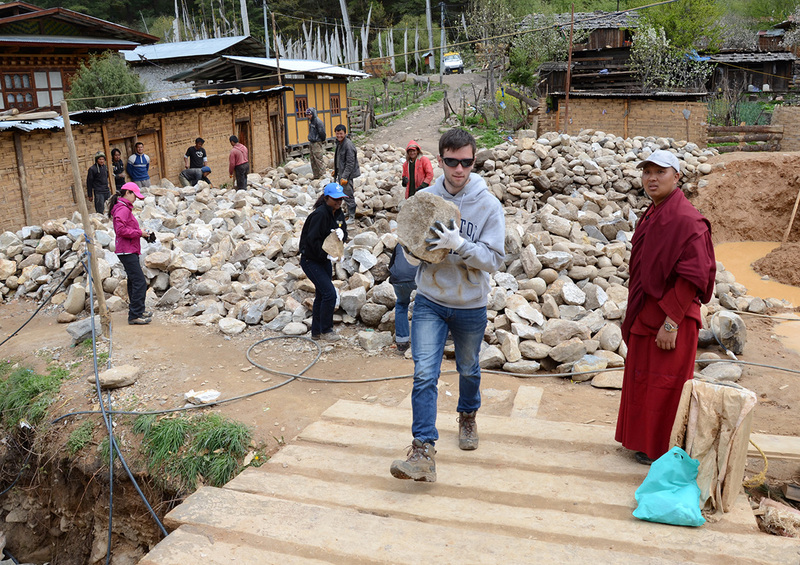 Before visiting Lhodrak Kharchu Goempa, on our last day of work, Ben pursued his interest in masonry at the Koenchog Sum Lhakhang . He left the group and went to find out how the mortar, consisting of mud and water, was made. Ana and Catherine had been hard at work pounding and sifting the dirt used to make the mortar, so Ben joined their ranks. This process of pounding and sifting insures that the dirt is all uniform and contains no rocks or clods that would compromise the integrity of the mortar. Ben then brought the fine dirt up to a mud pit where two experts were mixing a precise amount of water with the dirt to make a mud that had the consistency of thick porridge. After observing this process for half an hour or so, he carried the fresh mortar up the scaffolding to the masons who were using it to paste together rocks, forming the wall. Conscious of his novice knowledge of masonry, Ben sunk into the scaffolding and watched the masons expertly place rocks and build the wall. 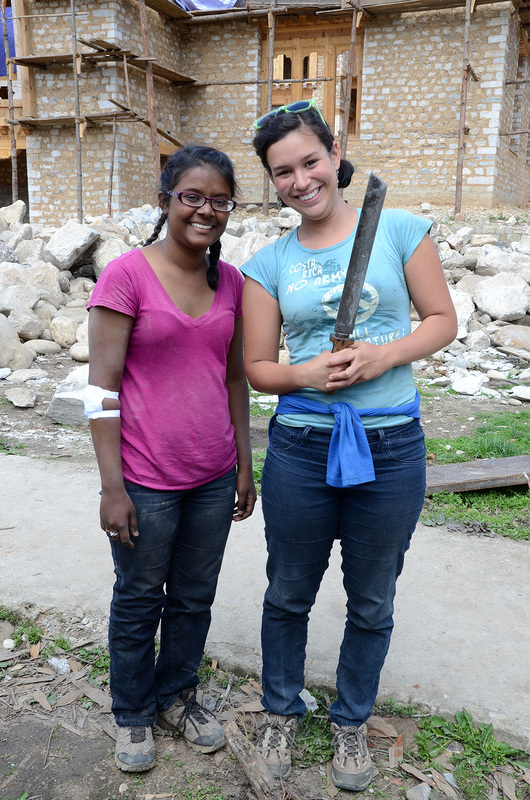 After a while, a mason called him over to help provide the plaster. After about ten minutes the mason told Ben he was taking a break, and said that Ben should take over placing rocks. He was reluctant at first, and asked the mason to observe his work to make sure that it was sufficient. Though Ben says he was slow and timid at first, the mason was receptive of his work and told him that he was doing a good job! He learned that building the wall involves two types of rocks. First, large rocks are planted as pillars to give structure to the wall. Second, small rock bits are broken off with chisels or sledgehammers and added to fill the cracks between large rocks. Ben stuck to filling in the cracks and breaking rocks for the first hour of this work. Eventually the head mason, the man in the black baseball cap, came over and told Ben that he was ready to place large rocks. He taught Ben how to break the rock with a hammer in a way that would produce a stable flat side. Nearing the end of the work day the head mason asked Ben to help him with a project. Eager to repay him for all of his teaching, Ben hurried over. They spent ten minutes shaping a large piece of granite into a perfect rectangle. He then proceeded to show Ben how to measure, re-measure and set the corner stone that would provide a necessary structure for the new layer of wall. This experience is one that Ben will hold dear for the rest of his life. With semi-laundered clothes, and exhausted selves, we boarded the bus to return to RTC at six a.m., and attempted to sleep off much of the eleven hour bus ride back to school. In time, the now-more-familiar views of the valleys and mountain passes flew past us, and we made it safely back to our dorm rooms. Perhaps we were not thrilled that our spring break trip was over, but we were certainly glad to be back at this place that has started to feel like a second home, albeit its location half way across the world.